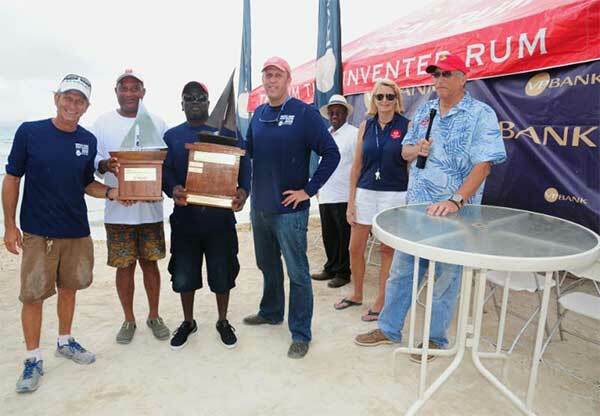 Intrepid take 1st place in the VP Bank Tortola Sloop Spring Challenge and the perpetual winners trophy presented by VP Bank President, Sjoerd Koster with Judy Petz, Regatta Director and Professor Geoffrey Brooks. Photo: Todd VanSickle. Today was all about switching gears and changing pace, with the 3rd Annual VP Bank Tortola Sloop Spring Challenge being raced off Nanny Cay as part of the BVI Spring Regatta's Maritime Heritage Day. 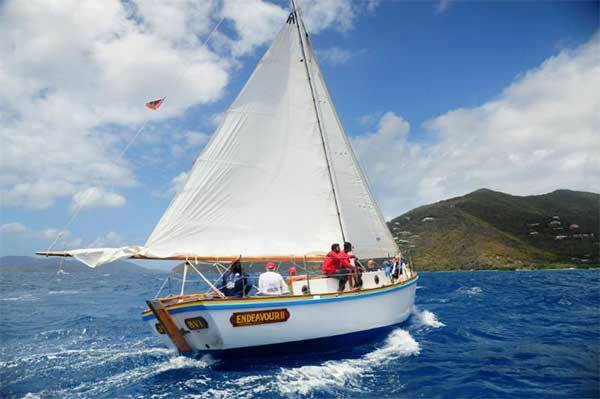 The Challenge brings to life the significance that the beautiful old Tortola Sloops played in island life more than a hundred years ago, and celebrates the theme of sailing which has always been a mainstay of island culture. Historically the Tortola Sloop was the lifeline of the Virgin Islands, which comprise some 60 islands, ferrying people and produce. 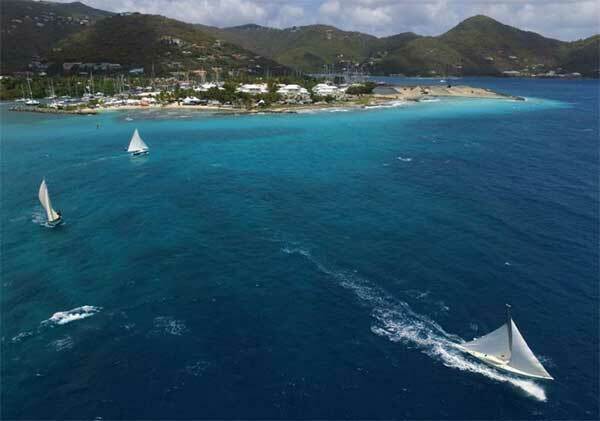 For example, beef was raised on Tortola and Jost Van Dyke, which was "shipped" by Tortola sloop to other islands. Daily life revolved around sailing, as this was a long time before motorized vessels and refrigeration. The VP Bank Tortola Sloop Spring Challenge, considered a Category "F" sailing event with fun being the primary goal, saw two races sailed today on a windward leeward course set off Nanny Cay for easy spectator viewing. Four boats competed, with the 100-year old Intrepid taking first place, Esmie placed second, and Youth Instructor took third. Unfortunately for the new boat on the dock, Endeavour II, a DQ for an over early start in race one put them out of the running for a podium place. John S. Duncan OBE, Governor of the British Virgin Islands raced today on Youth Instructor, along with today's event sponsor Sjoerd Kosted, President, VP Bank (BVI) Limited. The Governor enjoys sailing on his home turf in the BVI although he's usually on something a little drier and easier to handle than the Tortola Sloop. "It was heavy going out there, there was quite a swell and quite a wind, and these boats aren't built for racing, they're built for trade and cows," Governor Duncan commented. "But it's good to be part of the sailing heritage of the BVI and even better that the Governor can go out there and do that! Governor Duncan had his work cut out for him aboard Youth Instructor, commenting, "She's one of the heaviest of these boats and I think strength is a requirement for sailing these boats. I was on the helm for most of the upwind leg and it was quite tough going as without much of a rudder and small keel, you need to use the sails to steer with as much as anything else. She's a lovely machine even though there are no push buttons!" Sjoerd Koster, President, VP Bank (BVI) Limited and sponsor for today's event, also raced on Youth Instructor, arriving back at the dock just a little soaked from the experience, "I wouldn't call myself a sailor but it was fantastic out there, it's such a pleasure to be able to sail such a beautiful old boat which is part of the BVI heritage. VP Bank is extremely pleased to be able to do this for the third year in a row, and we hope to continue it for many more years." 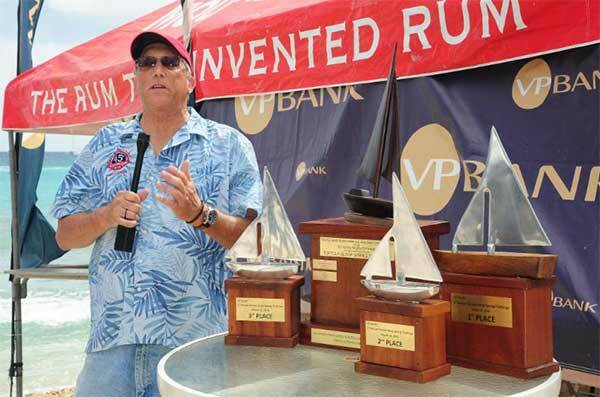 VP Bank sponsors the Sloop race every year at Spring Regatta, as well as other projects throughout the year. 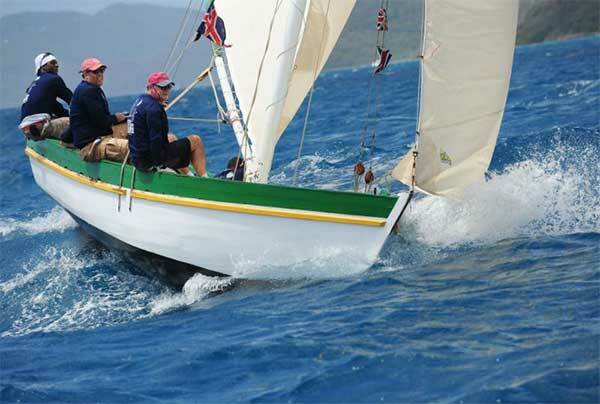 They have supported the publication of a book on how to build a Tortola Sloop, and Koster stated that he's hoping their next project will be raising funds to rebuild one of the sloops that is still to be finished. "We are trying to be as involved as we can to continue this heritage," Koster said. Endeavour II, a new addition to the local sloop fleet, was built by the Jost Van Dyke Preservation Society. Susan Zaluski, the Society director, raced her today and reminds that while she's fun to sail, she's by no means a race boat. "Today was all about fun, but she's not really a race boat and we're not racers!" Zaluski explained that because maritime traditions were fading in the BVI, the Society determined to build a replica of the Tortola Sloop. Endeavour II is built upon the design of the original Tortola Sloop but a little bigger all around, as Zaluski explained. "She's a new build, constructed from wood and epoxy, and sheathed in fiberglass," Zaluski said. "So that she could be more useable and longer lasting, she's larger than the other sloops in the BVI fleet and has a full keel for heavy weather sailing. Among other things, we use her to teach boat handling and as a research vessel for the Society." 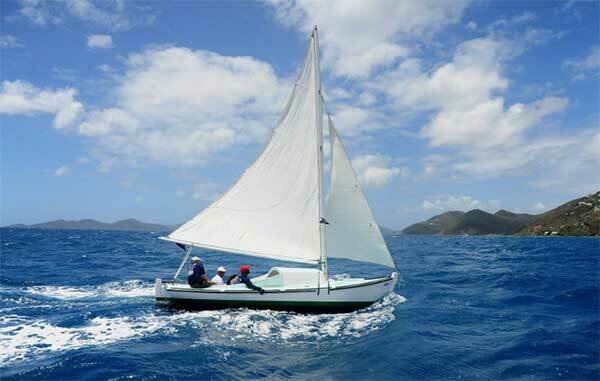 Racing in the 45th BVI Spring Regatta and Sailing Festival resumes tomorrow (Friday April 1) at 1000, with 13 classes racing on three courses. For now the Regatta Village at Nanny Cay is buzzing with anticipation, the docks are full, and the bars are open!